1. 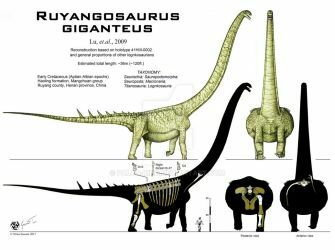 Tie between Alamosaurus (referred Mexican fibula + Fowler & Sullivan's neck centrum), Puertasaurus (1 cervical, 1 dorsal, 2 unpublished caudals) and Patagotitan a.k.a. the "Chubut Monster" (majority of skeleton from at least six specimens). All of of these animals appear to top out around 120+ ft. long and probably 100 tons. attempt to choke our breath. I pledge to you my loyalty, O Paleo Company! my arm and brush, exhort! with tooth and claw defend! The Egyptian Keystone: Mansourasaurus shahinae! 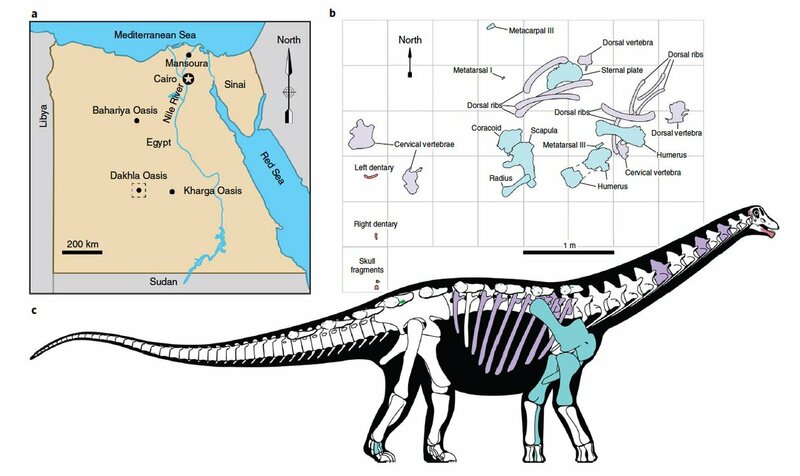 Recently we have this new species of titanosaur from Egypt which helps fill in some HUGE gaps. Egypt is of course famous for much mythology and lore surrounding the raising of obelisks and pyramid keystones or capstones. 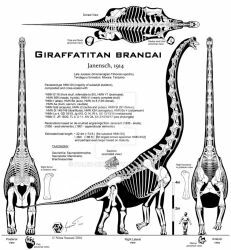 Now we can add to that list, the "holy grail" or "keystone" of titanosaur evolution - Mansourasaurus shahinae. Mansourasaurus shahinae is not all that large by titanosaur standards (the published skeletals shows it at about 8.5m, but I suspect that the neck was a good bit longer than they illustrated, as well as having more than the mere 13 vertebrae drawn here, so more like a total length of 10.5 or 11m at least), but enough of it was recovered to give us valuable info about one of the most obscure and murky parts of sauropod evolution - the not-too-taxonomically-stable family of titanosaurs called Argyrosauridae. 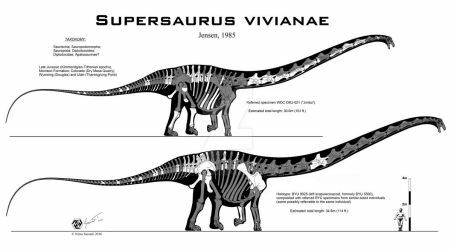 So far this family includes Argyrosaurus, Paralititan, Quetecsaurus, and probably Lirainosaurus and the "Cooper" titanosaur from Australia. None of these animals are known from complete skeletons, and most are not even known from a well-rounded sampling of both limb and backbone elements. However, now we can see an argyrosaur with both. 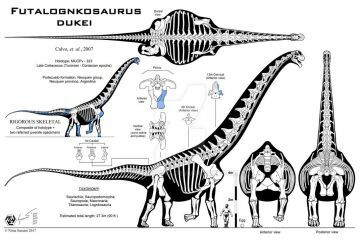 You can see here that the shoulder resembles Dreadnoughtus, which in some ways is the most "argyrosaur-like" of the longkosaurs. 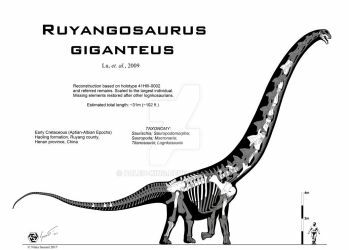 It also has a rough proportional resemblance to that of Muyelensaurus, which may be either an argyrosaur or a trigonosaur. 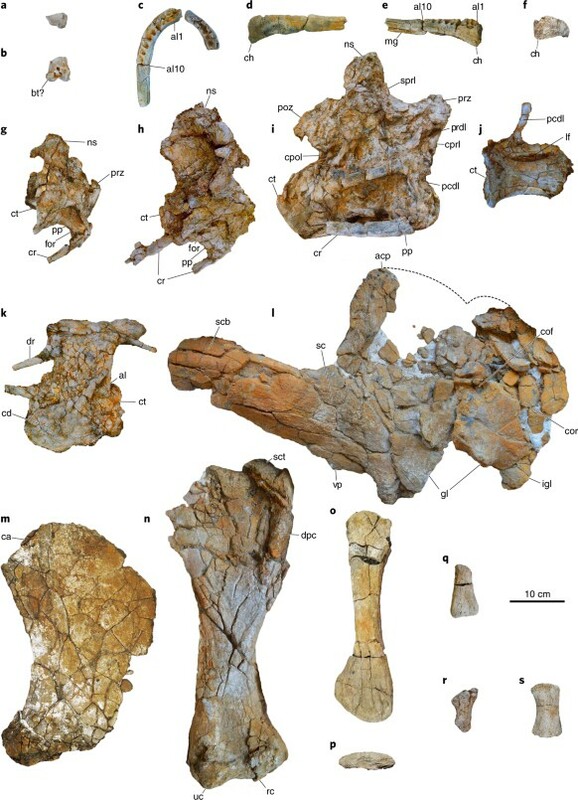 The biggest cervical vertebra they found has the same compacted proportions and oddly shaped "Phrygian" neural spine as the one known from Quetecsaurus, and the humerus is extremely wide and flat, with the lower condyles spaced far apart - the classic "surfboard" shape found in both Argyrosaurus and Paralititan, and to a lesser extent in Quetecsaurus. There is also a partial lower jaw including the chin. The curve of the jaw shows this animal had the standard rounded mouth of a high-browser, hinting that its neck was probably longer than in the paper's skeletal. It also shows that argyrosaurs did not have the square mouth of antarctosaurs, which is a critical difference in feeding niches as the two families are closely related. This article, unfortunately, is behind a paywall. Nature Ecology & Evolution is a journal owned by Springer, which is charging an insane $99 for access to just this one paper. I'm not encouraging anyone to pirate, but I won't shed any tears over Springer's loss if someone does. Springer's current fee-gouging model certainly is encouraging them! If the authors want to help the free flow of scientific data and also give this dinosaur the benefit of comparative research with other titanosaur experts (and I'm fairly sure they do), they should consider submitting future papers to open-access journals - it's too late for this paper as Springer already holds the copyright now. Instead, it's best to submit to PeerJ, Facets, PloS One, APP, Paleo-Electronica, any of them. They all respect author's copyright and do not charge the authors for digital copies. Springer, along with other corporate conglomerate journal owners like Elsevier, Wiley, Taylor & Francis, Bentham, etc., has never been a good choice, as it is restricting the free flow of taxpayer-funded research despite having no involvement with the grants process or the organization of the dig, gouging both professor and student alike, and not paying the authors a penny for the (unethical) privilege. And they're mostly bean-counters, not scientists. Until they start paying royalties to the authors of papers, this is a rotten deal all the way round. Dump Springer, move to Facets. Operating System: Anything but Vista! Personal Quote: "It must be new or bust!" Yes, this is the DA page of the original, REAL Paleo King - NOT one of the imitators, this is the real deal. I am a Paleo-Artist and Independent Paleontologist. I aim for both accuracy and elegance in my visual time-travel back to the Mesozoic, as is the case we observe in nature today. I have been featured in blogs, twitter, and even in a few very good books. All images are my own copyrights unless explicitly noted otherwise. 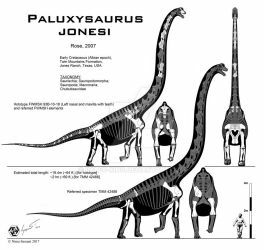 If you are interested in commissioning work or using any of my images in a paper, book, presentation or website, drop me a line at paleoking13@gmail.com. Any more Forgotten Giants coming soon? If not, when can we expect them? Do you have a time-frame in mind? 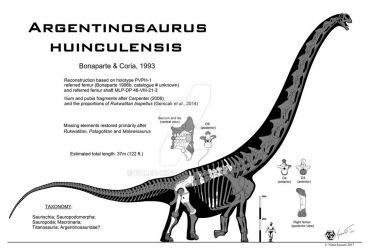 What’s your take on Carpenter’s Maraapunisaurus description so far? I know you were one of those supporting the Rebachisaurid classification so how does it feel for it to be realised? Well it's a strange feeling... but I would say that it finally makes sense, even though it doesn't matter much to me who formally redescribed it. 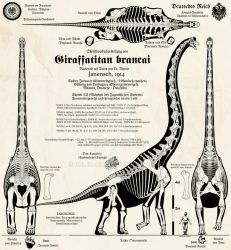 As a Rebbachisaur, it is less obscenely oversized compared to the largest other sauropods (we have seen several new titanosaur giants discovered in recent years - Puertasaurus, Paralititan, Futalognkosaurus Dreadnoughtus, Notocolossus, Patagotitan, Ruyangosaurus, and the new Alamosaurus specimens - none of which are significantly larger than Argentinosaurus, and most of which are not significantly larger than "Antarctosaurus" giganteus or the largest referred "Argyrosaurus sp." specimens). 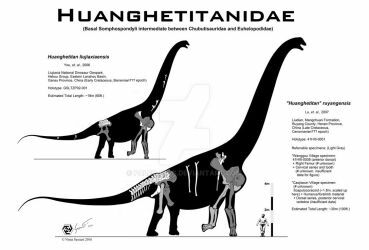 Other new giants like "Huanghetitan" ruyangensis, Daxiatitan, Sauropseidon, the French Monster, etc. are probably not even in that same mass range. 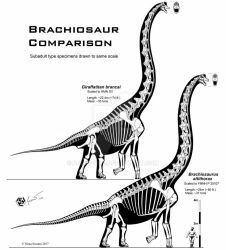 So in other words, the biggest sauropods we know of besides "Amphicoelias" fragillimus, are all much smaller that it would have been, had it been a diplodocid with Diplodocus-like or even Supersaurus-like proportions scaled up to 150 tons or more. 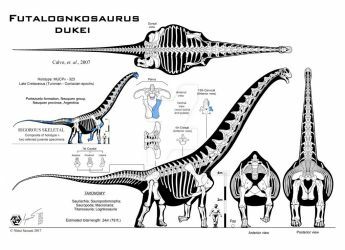 But a more compact animal with Rebbachisaur proportions, is more believable, both in terms of how much food it would have required, and how many of them a given ecosystem could sustain... not to mention the biomechanics of its mass and locomotion. Nonetheless, it is a bit odd to have a Rebacchisaur that huge, since all the other ones are not of particularly remarkable sizes. So, since you've made master lists for rebuking Torosaurus/Triceratops and Dracorex/Stygimoloch/Pachycephalosaurus, have you thought of doing one for Nanotyrannus/Tyrannosaurus? your sauropods are too big. And who might you be? No gallery, no journals, no comments, no name, no watchers. Sure, we should all totally take unqualified advice from a no-name troll, with no standing. I guess that is one of the most awesome reply i have seen. 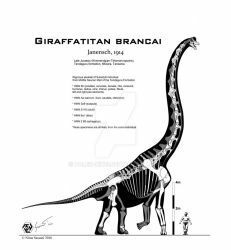 None of his brachiosaurids and diplodocids are too big. The only disagreements he gets are regarding his titanosaurs, of which most are within the expected size range. While I've always been critical of Horner's Toroceratops theory, I thought that the Dracorex-Stygimoloch-Pachycephalosaurus ontological series was widely accepted by scientists. What is the evidence against the series?